For one Baton Rouge couple, starting a fermented food business was all about trusting their gut. While you were trying to stay awake in your college microbiology class, Kaitlynn Fenley was falling in love. Peering through a microscope, she watched as microbes did their part to ferment a small amount of sauerkraut. She was smitten. Several years later, Kaitlynn would meet Jon Scott Chachere II and in 2016 the two decided to start their own business: Cultured Guru. 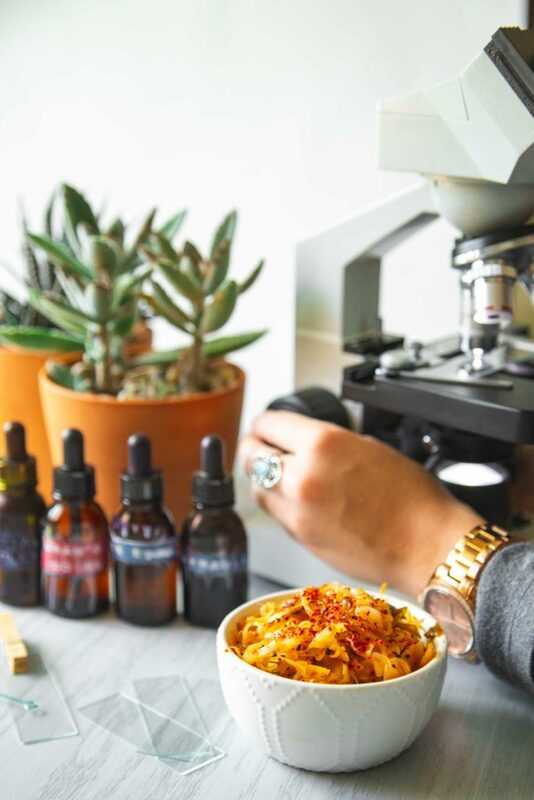 The company is Louisiana’s first commercial fermented food company, selling all natural, organic, probiotic-rich treats like kimchi, pickles and sauerkraut that are both tasty and good for you. We asked Kaitlynn and Jon about the science behind fermentation and the passion that drives Cultured Guru. Jon: One of my dreams is to work for myself. After graduating from Louisiana State University with a degree in digital advertising, I quickly learned that I was not suited for agency life; I was yearning for more freedom and to devote my skills to building up my own business. Kaitlynn: I love the “food is medicine” approach to health, and I love microbiology more than anything. There was nothing more perfect for me to do than this. I had been immersed in the world of natural healing and was very well-versed in the latest scientific developments regarding antibiotic resistance. Jon: She had the foresight to see that fermented foods were going to become a necessary part of our health. Did you do any research or test your products/ideas out? Kaitlynn: There are not a lot of online or published resources to help one start a fermented vegetable business in America. We had to innovate and develop our entire process based on my knowledge of microbiology and fermented vegetables. Luckily, my time spent pursuing a degree in microbiology shaped me into quite the problem solver. My schooling from LSU provided me with the skill set I needed to develop and make our process and recipes perfect. What was your biggest challenge in the beginning? Jon: Figuring out the laws that govern food production. There are two main routes you can take as a food business: make and sell under cottage food laws or producing out of a commercial kitchen. Under cottage food, making the food in your house is no problem, but you aren’t allowed to sell online, across state lines or sell more than $20K worth of goods per year. Wanting to future-proof our business, we figured the wisest option would be to take the extra steps to start producing out of a commercial kitchen. What has been your biggest surprise? Jon: The biggest surprise for me would be that the communities that we are a part of have really welcomed us and the foods we make. People are seeing the passion that we put into our foods, and they are responding. It’s so encouraging to see people try our fermented foods for the first time after telling us they don’t like kimchi or sauerkraut, and then picking up a jar because they had no idea fermented foods could taste so good. Tell us about your production process. Kaitlynn: Currently we hand-shred 200 pounds of produce for each barrel. After it is all shredded, we put the produce in our 30 gallon American White Oak barrels. Our cabbage products take four weeks to ferment, while our pickles take about two weeks. When we talk about fermenting vegetables, we are specifically referring to a microbial process called “lactic acid fermentation.” This particular fermentation occurs when very specific salt concentrations are added to vegetables so that certain bacteria thrive and produce lactic acid, the pleasantly sour substance that preserves the vegetables. The microbes that help us produce our delicious products come only from the vegetables and the earth in which they were grown. For the best probiotic microbes to flourish and produce lactic acid, we harness the delicate process of bacterial succession. Bacterial succession starts when the growth and metabolism of one bacterial species increases, permanently altering the environment. This leads to the death of that species and the take over of a different type of bacteria. As one type of bacteria dies off, the next type takes over until the ferment reaches a point with perfect living conditions for various species of Lactobacillus (which are the probiotic, lactic acid-producing bacteria). I check our ferments using microscopy, biochemical testing, and microbial metabolic testing at every stage of the fermentation process to ensure safety and natural probiotic quality in every batch. How do you decide what products to create? Jon: We knew that we wanted to source our produce locally, so we get all of our produce from Southside Produce in Baton Rouge. Kaitlynn: Sauerkraut was an obvious choice. It’s the go-to ferment when people start to get interested in fermentation. Sauerkraut is very traditional—it seems like everyone has interacted with sauerkraut in some form in their lifetime. We thought that producing a traditional sauerkraut would be relatable to our consumers and maybe even encourage them to keep going in their fermentation journey. Our fermented pickles were also a part of the original plan of products we envisioned. We don’t find many people fermenting pickles right now, and we thought it would be a cool and unique product to offer people. They’re a great way for parents to get their children to start eating fermented foods and colonize those developing guts with a rich population of bacteria! Jon: Kimchi, our most popular product, was not even part of the original lineup when we first launched Cultured Guru. We were going to ferment banana peppers, but we were having issues finding enough peppers and were racking our brains for something flavorful and unique. The abundance of cabbage in Louisiana brought us to the conclusion that making a vegan-friendly kimchi was just the thing for us. Plus, adding red to our color scheme of product labels made the trio of ferments look really eye-catching on store shelves. What is your most popular product? How can people find it? Kaitlynn: Our most popular product would be our fermented kimchi. We think people respond strongly to the kimchi because, in the South, everyone loves a good kick of spice. Contrary to what many people think, kimchi is very adaptable and can be put on many things from tacos to avocado toast. Plus, our kimchi is unique in the fact that it is vegan-friendly. Many traditional kimchi recipes include some sort of fish sauce or paste. We subbed out those parts for kelp (a sea vegetable) to maintain a similar umami flavor that you would find in a traditional kimchi. We have a store locator on our website that anyone can access to see the complete list of stores we are in. We are in 26 stores total but always looking to stock more! If you own a storefront and would like to stock our ferments, please fill out our wholesale form so we can set you up with a wholesale account. What are the main benefits of eating fermented food? Jon: Regular and healthy digestion, gut microbiome balance, clear skin, and the highly protective benefits of a healthy microbiome. Kaitlynn: Basically, gut health impacts the health of all other organ systems, including your skin. DNA to DNA comparison of all the DNA located in and on your body: it’s 90% microbial and 10% human. Which means in a lot of instances, that microbial DNA impacts what is happening to your body more than your own genes do. What’s next for Cultured Guru? Jon: We are happy to announce that Cultured Guru will soon be moving into its own commercial kitchen space! We will be able to support at least a 15 barrel operation (we currently are only using 3 barrels to make all of our food.) We will also have the space to start developing new products and really start to get into more stores around the state. What would you most want people to know about Cultured Guru? Kaitlynn: That it’s not all sunshine and rainbows like on our Instagram. We cry and stress and have anxieties about our business because we love it so much. Even when it’s not 100% perfect, we still love our little business unconditionally. Also, it’s only me and Jon. All the photography, blog writing, food making, food jarring, food plating, Instagram posting… it’s all me and Jon. Finally, Kaitlynn, what’s your favorite bacteria and why? Kaitlynn: Vibrio fischeri. It’s a bacterium that’s bioluminescent based on the population of bacterial cells. It’s beautiful! Learn more about how fermentation is driving culinary experimentation in this article from Food Business News. Sign up for our newsletter, and get the tastiest content around delivered to your inbox. Do you know where your food box is tonight? For our Content Writer Cali Mitchell, a trip to Cuba was about more than finding plantains (spoiler alert: she didn’t). It was a journey to trace her family’s roots.